Orders are dispatched within 3 working days and are sent Express Post with Australia Post. You can specify a different delivery address to your billing address when you place your order. Your office is a good option if you know someone will be there to take delivery between 9am and 5pm. Orders that are not taken for delivery will be sent to the nearest post office. Our warehouse is based in Victoria so please allow an extra day for all Victorian public holidays. USA order under 500g (eg. wallets, pouches & Little Black Books) incur a flat rate of $12. All other purchases will incur a flat rate of $25. Orders are dispatched on Tuesdays and Thursdays and will take 5-16 business days to arrive. We use Australia Post for all US parcels and you will not be provided with a tracking number. You can specify a different delivery address to your billing address when you place your order. Your office is a good option if you know someone will be there to take delivery between 9am and 5pm. Please email sales@shopnomadic.com if you would like to discuss Express shipping options. Please do not email us requesting tracking numbers or an update on delivery times - we endeavor to keep our international shipping fees low by using this Air mail. You can, however, enquire about other higher-cost alternatives for speedier delivery. Please note, international deliveries may incur taxes and duties applied by customs in the country where the order is delivered. International orders under 500g (eg. wallets & pouches) will incur a flat rate of $19 and a flat $39 on all other purchases for standard parcel deliveries. International deliveries may incur taxes and duties applied by customs in the country where the order is delivered. We use Australia Post Air Mail, so you will not be offered a tracking number. You can expect delivery within 5-16 days. Please email sales@shopnomadic.com if you would like to discuss Express shipping options. 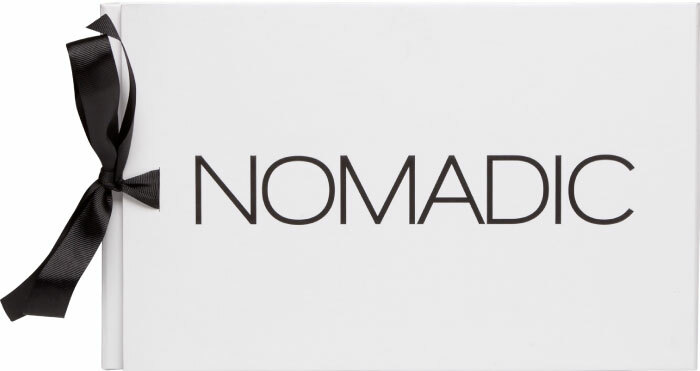 If you are intending to send your purchase as a gift, please e-mail us and we can include a Nomadic gift box. If you are sending as a gift, please ensure the gift is addressed correctly. Shopping online has become a fast and convenient way to shop… But NOMADIC understands that sometimes when you see the item in person you might change your mind. We respect this decision. So if you return the item/s within 7 days of receiving your item/s in the same condition and unused (in original packaging with swing tag attached), we will happily refund or exchange your item/s. If you require a refund or exchange, please email returns@shopnomadic.com for details on how to return your item/s. In this case, the customer will be responsible for the return shipping charges. If the product is lost in transit, we will not be held liable and therefore we recommend you send returns via insured registered post. However, for exchanges, we will not charge any additional shipping fees on the new item! International returns will only be refunded. If an item develops a fault after the 7 day return period, you may be entitled to a refund or exchange on the faulty item. Please email returns@shopnomadic.com if you believe your item is faulty and we will advise you on how to return your item for inspection. Once the product is deemed a manufacturer’s fault and not attributable to wear and tear, we will either refund or exchange the item and also reimburse you for any reasonable shipping charges (make sure you include a postage receipt). Please note that leather, like your own skin, is susceptible to general wear and tear. Daily wear or improper use may accelerate the wear and tear process and will NOT be deemed a manufacturer's fault. So... please be kind to your NOMADIC bag! If wear and tear occurs, you can take your bag to any local shoe repair - or there are speciality handbag restoration companies such as My Bag Spa. Unfortunately we are unable to offer a Refund or Return on an item that has personalised at the fault of the customer. Only faulty items can be Returned/Refunded. Please note, before purchasing a NOMADIC bag that misuse will not be considered a manufacturers fault. Your item will be inspected by our team before a refund will occur. Do not overload your bag with excess weight as this will be considered as improper use.